I have recently discussed with people working at Microsoft. Unfortunately, they are not doing data mining or machine learning research in Switzerland. I think that everything concerning research is in Redmond. I suppose that they are involved in data mining for at least two reasons: MSN Search and Microsoft SQL Server. The website IT-director has an article concerning SQL Server. According to its author, David Norris, data mining services in SQL Server are very interesting. He writes that “what Microsoft has done is to make data mining available on the desktop to everyone“. However, no details are given in his article about data mining techniques used. 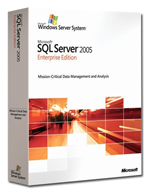 Although I have never used SQL Server, I suspect that it is more about data analysis than really data mining. And actually, Microsoft Research has labs in five locations: Redmond, Cambridge UK, Beijing, Silicon Valley, and Bangalore. We do research related to machine learning, applied statistics, and data mining in several of them. The guy from Microsoft Switzerland was telling me that all research was certainly in Redmond… good to know that it’s not exactly the case. Thanks!